In Luang Prabang, Laos, we had amazing dal at Nazim’s Indian restaurant. I was pretty sure it had garlic and dill, so I created this recipe at home. It turned out yummy! I used yellow mung beans, but other yellow dals would work too such as toor dal or chana dal. Heat oil in a pressure cooker and saute the onions for a couple of minutes. Add the tomato, dal, water and turmeric. Cook on high until the first whistle, then turn to medium and cook for another 5 minutes. Open cooker by first running under cold water to let out all the steam. 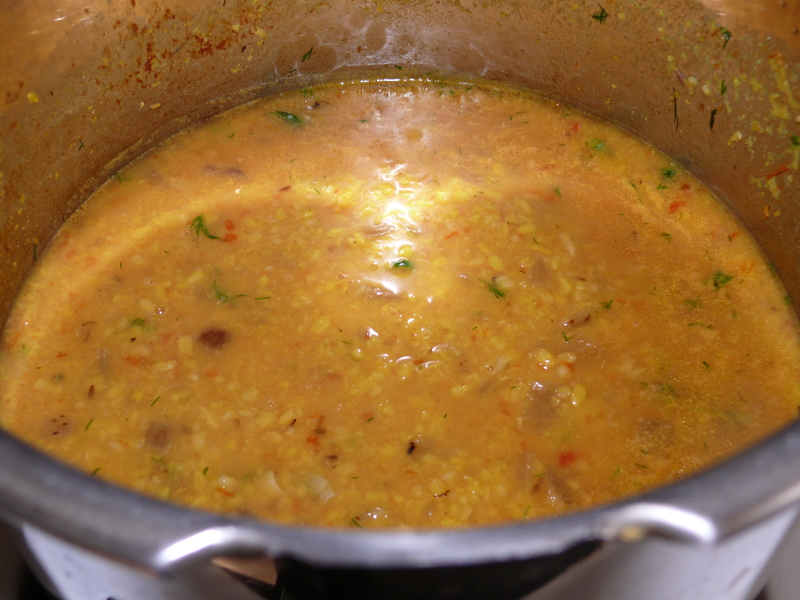 Blend a little with an immersion blender so that some of the dal is blended and some whole. In a tadka or other small pan, heat the butter or ghee (if using butter, keep the heat pretty low to keep from burning). Add the cumin seeds, garlic and green chilis. Once the cumin crackles and the garlic looks soft, add the dill. Add to the dal and salt to taste.